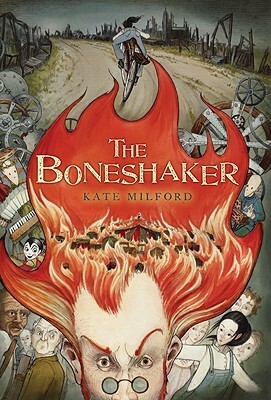 The Boneshaker by Kate Milford. Clarion Books, 2010. Currently Available. Face Value: This cover does a great job of capturing the specific creepiness of this story. I love that it’s illustrated (middle grade covers seem to be more likely to go with the illustration), and I love that even though this cover packs a whole lot into it, your eye is still drawn to Natalie on her Chesterlane. Does it Break the Slate? This book shatters slates, right and left. Natalie is an outstanding protagonist, right on the cusp of childhood/teenagerhood. She literally has to save the world. But she also has smaller battles to fight, and she handles them remarkably. Who would we give it to? Anybody who thinks Steampunk is overdone or uninteresting, because this will change your mind. Also if you loved Ray Bradbury’s Something Wicked This Way Comes, you’ll love the way this book is reminiscent of that classic story while being it’s own totally original piece. Review: Something strange is happening in the small town of Arcane. It’s 1913 and Natalie Minks can feel something wrong as soon as Dr. Jake Limberleg and his traveling medicine show arrive. But the town is swept up in the miracles the show offers. As Natalie digs deeper into the secrets of the fair she discovers something even more sinister than she could have imagined, something that only she can stop. This book took me awhile to get into actually. I listened to it on CD, in my car, and found myself struggling to focus on the heavy exposition at the start of the book. But once I was invested in the characters and the story, this was one of those books I found myself running extra errands just to have an excuse to listen a little longer and find out what happened next. And it was somewhere around the halfway point that I realized that all of that exposition wasn’t clumsy – it was intentional. Kate Milford rolled us into the sleepy world of Arcane slowly, giving us all the information we needed to hear upfront, in a way that it couldn’t possibly seem all that important. But when everything comes together at the end – incredible. First on the list is the characters. Natalie is a heroine worthy of Meg Murray in A Wrinkle in Time – a fiercely real character who ends up with the fate of the entire world resting on her shoulders. But there’s nothing flat about her heroism. She is stubborn and smart and curious and angry. She’s angry that her mother is suffering from a mysterious illness and that no one is talking to her about it, angry that she can’t figure out how to ride her beautiful bicycle, angry that people aren’t as easy to figure out as machines. And like Meg – Natalie’s flaws are part of what ultimately let her save the day. I also loved Miranda, Natalie’s prissy friend who turns out to be surprisingly resourceful and brave in her own right. Just in the moments when Natalie needs an ally, Miranda is there, and she serves as a foil to Natalie’s tomboy-ways without being a drippy stereotype. There are also some great adult characters who give Natalie the guidance she needs, even if she has to go the final step (or terrifying bike ride through hell) on her own. But the real magic of this book is in the world-building. Milford strikes the perfect balance of historical fiction and horror story, and this book is straight-up legitimately scary. Limberleg and his Paragons of Science are terrifying and compelling – I can understand why the town was both captivated and repelled by their presence. And the gingerfoot – one of the creepiest ailments I’ve ever read about. It gets even creepier when you find out it’s based on something real in history. And from a Slatebreaking perspective, it’s not just about the terrific female characters. At its core, beyond the horror and the history, this is a story about the moment in childhood when we realize that our parents are flawed humans. Even if we love them despite these flaws, this transition is a unique growing up moment that we can never go back from. How we handle this, and the person we become afterwards, is a huge part of growing up. We would be lucky, if we could all handle it with as much grace and bravery as Natalie Minks. Reviewed from library copy of audio book. This entry was posted in Middle Grade, Reviews and tagged Historical Fiction, Horror, Machines, Steampunk. Bookmark the permalink.